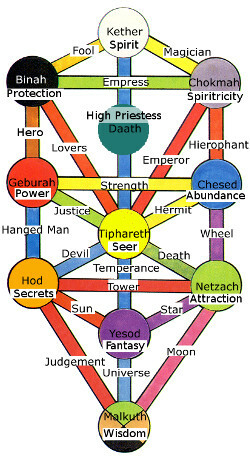 In the Tree of Life there are 11 main spheres called Sephira. You can visit these places in dreams, travel meditation, or out of body travel. However the TOL main spheres are not the only places that you can visit. Between each TOL sphere is a connecting tunnel and in between two spheres is a tarot card location. These tarot card locations are actual nonphysical places that you can visit. And, by going there, you can embark on speical quests that will yield you special rewards. These rewards are given to you by completing some task, test, or demonstrating your ability to understand some spiritual truth. After you complete the quest, you are given a one-time energy upgrade (old term: initiation). This energy is a fast-track spiritual energy that advances your evolution many times. It permanently changes your energy field to reflect a higher vibration and often it will add a new quality to that energy field. These places are best traveled from Main Tarot Path Quest locations first then on to the Supplemental Quest Locations, but in theory any order will do. Going from HAS up the Kether locations, you will gain a progression of energy and abilities that will help you i ways you cannot imagine. Spend one week on every location. Try to do several meditations to that one place each week. These places will alter your energy field and create you into a new person over the course of 6-plus months worth of spiritual journeys. The entire ToL tarot journey is a wonderful experience you will cherish for the rest of your life. Hermes Astral Shop: Easily reachable nonphysical place where help, comfort, and healing take place. The Pub @HAS: The Pub @HAS is a wonderful place to experience Brotherhood, laughter, healing, and spiritual advice. Healing Center @HAS: Located in Malkuth in the Tree of Life, the HAS Healing Center can help you to heal or you can go there to lend a hand helping to heal others! Castle Sandalphon @malkuth (wisdom): Visit Castle Sandalphon when you need help with human matters or just want some sage advice from the wisest human that every lived. Spirit Beach: A good place to go to rest up and contemplate the things in your life that you want to change. Uncover delusions and see a way to get past inactivity and inertia. The Carnival: This place is full of holiday fun. Visit here during your favorite holiday to see how people party on the other side! Eye of the Needle: Reality Creating is about timing, focus, and intensity. It is about threading your thoughts through a finite set of opportunities. Crystal Palace (universe): Where you go to learn that you are made up of energy and that your form is changeable. Towers of Light & Dark (moon): Discover the spiritual undercurrents that are fueling some reality creation in your life. Pillars of Light & Dark (judgment): Spiritual judgment and justice. Mushroom Forest @yesod (fantasy): The Unconscious mind. Rest from physical reality. Nourish the childlike creative side of yourself. Explore your dreams. Observatory (star): Travel outside the Earth. Here you find that your spirit is capable of remarkable things. House of Light (sun): Experience pure joy and illumination. Tracy Island @hod (secrets): A place to go when you seek hidden knowledge, truth that has been kept from you, or to reveal secrets. Cruise Ship Haniel @netzach (attraction): The Law of Attraction is what pulls reality together and enables cooperation with others. See what attractive forces are working in your life and learn about them. Resolution Point (tower): Understand why some of your creations fail and what you may do to rebuild from what is left. The Plantation (devil): Break the cycle of obsessive behaviors or addictions. Free yourself from anything that traps you in your life. The Tomb (death): Death & rebirth. It is a place of reflection and solitude. You must examine the past and what happened, what caused it, and what has to change so you can move forward and start anew. The Meadow (temperance): Rest, rejuvenation, and restoring balance to your energy field and your life, especially after a traumatic encounter or situation. Sunzu Garden (temperance): Magic and wonder is everywhere! Learn how to tap into it using your imagination, open the 'Chest of Surprises' and wield the 'Staff of Thought.' Place of myth and legends. Tiphareth University, Learning/Healing Center, @tiphareth (seer): Greater Learning: Seek new knowledge. Get healing work done or even to use your healing skill on others. Infinity Valley (wheel): Meet fate and the many ways and forms it can take. Meet with the Oversouls to learn how your life fits in with the grand design. Hangman's Peak (hanged man): Get help and guidance on how and what road you can possible change to. Change the course or direction your life is taking. Rest and pause before moving ahead with current plans. Hermit's Cave (hermit): Your personal space where it is just you and spirit. Meet spirit as an internal force, loving and nurturing you, giving you strength, driving you forward to the new path that awaits for you. Justice Glade Council Chambers (justice): Training grounds of the Magical Dragon! Learn about Spiritual Justice or get help in restoring balance to something in your life. Power Pyramid @geburah (power): Energy, power, will! Realities would not exist without these. However, these must be wielded wisely and properly. Here you will learn how to use energy and power in perfect harmony. Beach House @chesed (abundance): Abundance is part of the universe’s core tenants. The universe is infinite and so is abundance. Learn how to create this much sought after energy in your life. Strength Tree (strength): Spiritual strength is the ability to overcome difficulty, not with force or physical action, but with will power, integrity, love, and harmonious purpose. Emperor's Retreat (emperor): Find the leader within you. Help those around you find order when all they see is chaos. Learn how to organize and direct others. Ivory Tower (lovers): Your choice for the future: follow the spiritual path or the mundane one. Altar of your Word (hierophant): Your Word is the unique message that you bring to this life and this reality and even the universe. Hero Academy (hero/chariot): Being a hero is about controlling your human strength and your spiritual strength. Everyone has the hero within them. You just need to find yours. Valhalla @binah (protection): Obtaining your black outline of protection, meeting with the Knights of One, preparing to cross the abyss. The Towers @chokmah (spiritricity): TOR, TOO and TOC Towers which help to stabilize your spiritual energy in various ways. Empress Garden (empress): Activate the seed of your new reality and watch it take form! Earthly form of Empress energy. Empress Starship (empress): Meet the energy of star birth and even the Big-Bang! Spiritual form of Empress energy. Priestess Heights @daath (high priestess): A seductive and beautiful city where the ground is covered in spirit. See the blueprint of what you are working on creating next. The Stage (magician): A place where the will of the magician is made manifest. It is a place of magic and wonder, illusion, and grand design. Stonehenge Portal Room (fool): Who are you? What are you? Touch your past, present future. Finally touch your Soul! Abyss Gateways (abyss): A way to enter Kether without having to cross the Abyss and invoke the traditional test that must be passed. Stonehenge Garden: merging with HGA (transformation): Your Holy Guardian Angel and the merging with divinity! Kether Transit Hub (traveler): A place where you can just about go anywhere and do anything! Kether City (apprentice): human-like city in Kether where you can learn to become immortal! Kether Citadel @kether (spirit): The spiritual seat of power. Metatron can be found here, as well as the council of twelve that govern spiritual matters in general. Starship Ithos (merkabah): Learn the secrets of travel meditation and dive into probabilities and alternate realities. See how your reality is put together on the architect level. Help send aid and spirit to people and places that need it. Time Tunnel: Travel forward or backward in time. Undo Karma, or just to understand the past. Cloud Cities: Etheric based cities where the masters and angels help the planet. Go here to pitch in a hand. Restaurant at the End of the Universe: Experience fun, wacky, and bizarre in this place that has its roots from the Douglas Adam’s book, “Hitchhikers Guide to the Galaxy. Christmas Village: Christmas is celebrated here, no matter what time of year it is.